The ArtSalon goes to Turners Falls, April 16th! Amy Borezo works in artist’s books, relief printing, and painting. An early interest in narrative led organically into the exploration of the book as art form. This medium has proved a rich field in which to explore themes that occur throughout her work, including the inherent tension between idealism and reality, the group and the individual, the natural world and the man made. Amy is also a professional bookbinder working with fine press publishers to design and execute limited edition bookworks. Sarah Bliss is an artist and filmmaker with a background in religious studies. She explores the relationships between body, place, language, and memory, engaging both personal and social history. Current projects include Waterbody, an immersive room-sized video installation developed in collaboration with sculptor Rosalyn Driscoll; and the curation of The Embodied Voice, a 2016 project for the Hampden Gallery at University of Massachusetts Amherst that surveys performance, sound, and moving image artists who work with voice as subject or tool. Bliss’ work has been recognized by a Massachusetts Cultural Council Fellowship in Sculpture/ Installation/New Media; and by the Brazilian Azorean Prize of Plastic Arts. Recent screenings include a new media public art commission on Boston’s 80-ft tall, seven-screen MCCA Marquee; the Alchemy Film Festival, Scotland; TransArt Film Festival in Berlin; STIFF Seattle; Espaço Cultural ESPM in Porte Alegre, Brazil; Artspace Projects in Sydney, Australia; and the Creon Gallery in New York. She received her M.T.S from Harvard Divinity School, teaches video production at Greenfield Community College, and serves on the Board of Temenos, an off-the-grid non-sectarian retreat center in rural Massachusetts. Cathe Janke is an artist and a present member at Zea Mays Printmaking in Florence, Massachusetts and working with Wingate Studios, in New Hampshire. In the past three years she traveled extensively in India and Burma participating in the art residency, RIACE. 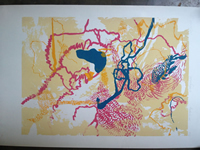 and teaching and printing a serigraphy at BK College of Art in Bhubaneswar, India. In the past year she had work in NY Art Book Fair, Sister Sister at MOMA PS1, New York. Deeply inspired by her travels Cathe has recently been working with painting, printmaking, drawing, everyday materials, found objects, local/seasonal plants, salt, and food coloring. She has used milkweed with seed pods that float on air currents, and sparkles that attach to peoples’ feet to travel with them. 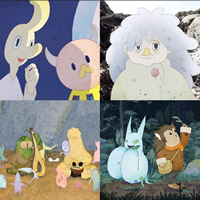 Overture animates stories of animism and cosmic nature with funny creatures. Collaboration and improvisation play key roles in hand drawn animations, illustrations, comics and a variety of live events and performances. Their work has screened and been presented widely, domestically and abroad. Started by Jason & Aya Brown in Okutama, Japan 2004. This ArtSalon is made possible in part by a grant from The Art Angels and from support by Florence Savings Bank and Sandy and Mary Dibble. We are also happy to announce Turners Falls RiverCulture as a sponsor for this event.